As we need presently need a break and since we still haven’t located the rest of the article shown below (hoping some new reader might help us! ), the following is a reprise which we trust will prove profitable. Blessings in Christ our King! 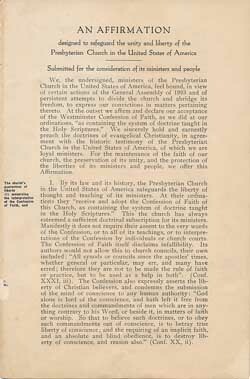 The Auburn Affirmation was first issued on December 26, 1923, in response to the action of the 1923 General Assembly of the Presbyterian Church in the U.S.A. It was then published in its first edition in January of 1924. 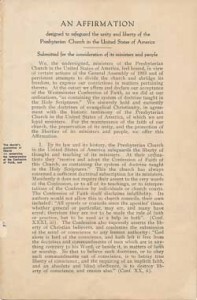 Affixed to that document were the names of 150 pastors and elders within the Presbyterian Church of the U.S.A. A subsequent printing issued on May 5, 1924 contained the final list of signators, numbering 1274 names. The Affirmation was a thinly veiled attack upon core tenets of the Christian faith. By most accounts the Affirmation was a gauntlet thrown down in response to five fundamentals espoused originally in The Doctrinal Deliverance of 1910, a deliverance which was later reaffirmed by the PCUSA General Assemblies of 1916 and 1923. It was specifically the action of the 1923 Assembly that brought about the reaction that was the Auburn Affirmation. 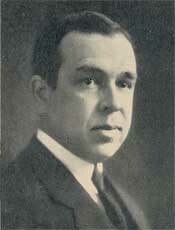 It was this subject that J. Gresham Machen took up in in the December 1924 issue of The Bible Today, the house organ of The National Bible Institute, an evangelical school located in New York City. Given the issues at hand before the Church that year, Machen’s article would have to be considered one of the earliest replies to the Affirmation signatories, though he does not specifically mention the Affirmation by name in this first part of his discussion. And since we only have the first part of this article available to us, we will have to leave it stand at that, until some gracious donor comes forward with other issues of The Bible Today. We’re looking particularly for vol. 19, no. 4, January 1925. From another source we know that part two of this article appeared on pages 111-115 of that issue. (We’re also looking for any other issues of The Bible Today from the years before 1941). So, introduction aside, here is the text of “The Virgin Birth” by J. Gresham Machen (1924). THE BIBLE TO-DAY, 19.3 (December, 1924): 75-79. An address delivered at a National Bible Institute Bible Conference, New York City. ACCORDING to the belief of all the historic branches of the Christian Church, Jesus of Nazareth was born without human father, being conceived by the Holy Ghost and born of the Virgin Mary. In the present lecture we shall consider very briefly the origin of this belief. The belief of the Christian Church in the virgin birth of Christ is a fact of history which requires an explanation. And two kinds of explanation are possible. In the first place, the belief may be explained as being based upon fact. It may be held that the Church came to believe in the virgin birth because as a matter of fact Jesus was born of a virgin. Or in the second place it may be held that the belief arose in some other way. The task of the historian is to balance these two kinds of explanation against each other. Is it easier to explain the belief of the Church in the virgin birth on the hypothesis that it originated in fact or on the hypothesis that it arose in some other way? We shall first examine the former hypothesis—that the belief in the virgin birth is based upon fact. Of course, the most obvious thing to say is that this belief appears in the New Testament in the clearest possible terms. And most of our time will be taken up in examining the New Testament evidence. But before we come to examine the New Testament evidence it may be well to glance at the later Christian literature. At the close of the second century, when the Christian literature outside of the New Testament becomes abundant, when we have full information about the belief of the Church at Alexandria, in Asia Minor, at Rome and in the West, we find that everywhere the virgin birth was accepted as a matter of course as one of the essential things in the Christian view of Christ. But this same kind of belief appears also at an earlier time; for example in the old Roman baptismal confession which was the basis of our Apostles’ Creed, in Justin Martyr at the middle of the second century, and in Ignatius, bishop of Antioch, at the beginning of the century. There were, it is true, denials of the virgin birth not only by opponents of Christianity but also by some who professed a kind of Christian faith. But all of these denials look far more as though they were due to philosophical prepossession than to any genuine historical tradition. The plain fact is that the virgin birth appears just as firmly fixed at the beginning of the second century as at the end of it; it is quite impossible to detect any gradual establishment of the doctrine as though it had to make its way against opposition. Particularly the testimony of Ignatius and of the Apostles’ Creed shows not only that the virgin birth was accepted at a very early time, but that it was accepted as a matter of course and as one of the facts singled out for inclusion even in the briefest summaries of the most important things which the Christian needed to know about Christ. Even this evidence from outside the New Testament would suffice to show that a firm belief in the virgin birth existed in the Christian Church well before the close of the first century. But still more important is the New Testament evidence, and to that evidence we now turn. The virgin birth is attested in two of the New Testament books, the Gospel according to Matthew and the Gospel according to Luke. The value which will be attributed to this testimony depends of course to a considerable extent upon the view which one holds of each of these two Gospels as a whole. Obviously it will not be possible to discuss these questions here; it would carry us too far afield to discuss the evidence for the early date and high historical value of the two Gospels in which the virgin birth appears. But one remark at least may be made in passing : it may at least be observed that the credit of the great double work, Luke-Acts, has been steadily rising in recent years even in circles which were formerly most hostile. The extraordinary strength of the literary evidence has led even men like Professor von Harnack of Berlin, Professor C. C. Torrey of Yale, and the distinguished historian Professor Eduard Meyer, despite their rejection of the whole supernatural content of the book, to accept the traditional view that Luke-Acts was actually written by Luke the physician, a companion of Paul. It will not be possible here to review that literary evidence in detail; but surely the evidence must be very strong if it has been able to convince even those whose presuppositions render the hypothesis of Lucan authorship so extremely uncomfortable. But if the Third Gospel was really written by Luke, its testimony as to events in Palestine must surely be received with the greatest possible respect. According to the information derived from the use of the first person plural in the Book of Acts, Luke had been in contact with James, the Lord’s own brother, and with many other members of the primitive Jerusalem Church. Moreover he was in Palestine in A.D. 58 and appears there again two years later; so that presumably he was in the country during the interval. Obviously such a man had the fullest possible opportunity for acquainting himself, not only with events concerning the Gentile mission of Paul but also with events in the life of our Lord in Palestine. It is therefore a matter of no small importance that the virgin birth is narrated in the Third Gospel. But the virgin birth is not merely narrated in the Third Gospel; it is narrated in a very peculiar part of that Gospel. The first two chapters of the Gospel are possessed of very remarkable literary characteristics. The hand of the author of the whole book has indeed been at work in these chapters, as the elaborate researches of von Harnack and others have clearly shown; but the author’s hand has not been allowed to destroy the underlying literary character of the narrative. And that underlying character is very strongly marked. The truth is that the first two chapters of Luke, with the exception of the typical Greek sentence in Luke 1:1-4 , are in spirit and style, as well as in thought, nothing in the world but a bit of the Old Testament embedded in the midst of the New Testament. Nowhere is there a narrative more transparently Jewish and Palestinian than this. It is another question how the Palestinian character of the narrative is to be explained. Some have supposed that Luke used a written Palestinian source, which had already been translated into Greek or which he himself translated; others have supposed that without written sources he has simply caught the truly Semitic flavor of the oral information that came to him in Palestine. At any rate, however the Palestinian character of the narrative is to be explained, that Palestinian character itself is perfectly plain; in the first two chapters of Luke we are evidently dealing with a narrative that came from Palestinian soil. That fact is of great importance for the question of the virgin birth. It shows that the virgin birth was narrated not merely in Gentile Christian documents but also in the country which was the scene of the narrated event. But there is still another reason why the Palestinian character of the narrative is important. We shall observe in the latter part of the lecture that the great majority of those modern scholars who reject the fact of the virgin birth suppose that the idea of the virgin birth was derived from pagan sources. But if that hypothesis be accepted, the question arises how a pagan idea came to be attested just by the most transparently Jewish and Palestinian portion of the whole New Testament. The Palestinian Judaism of the first century was passionately opposed to pagan influences, especially that loyal type of Palestinian Judaism which appears with such beautiful clearness in Luke 1:2 . How could a pagan idea possibly find a place in such a narrative ? The question is really unanswerable; and in order to attempt to answer it, many modern scholars have had recourse to a truly desperate expedient—they have maintained that the virgin birth was not originally contained in the Palestinian narrative found in the first two chapters of Luke but has been inserted later into that narrative by interpolation. This interpolation theory has been held in two forms. According to the more radical form the virgin birth has been interpolated into the completed Gospel. This hypothesis is opposed by the great weight of manuscript attestation, there being not the slightest evidence among the many hundreds of manuscripts containing the Gospel of Luke that there ever was a form of that Gospel without the verses narrating the virgin birth. A more cautious form of the interpolation theory has therefore sometimes been preferred. According to that more cautious form, although the words attesting the virgin birth formed an original part of the Third Gospel they did not form an original part of the Palestinian source which the author of the Gospel was using in the first two chapters, but were interpolated by the author himself into the source which elsewhere he was closely following. What shall be said of this interpolation theory? Very often the best and only refutation of an interpolation theory is the refutation which a distinguished preacher is once said to have applied to theosophy. A lady is reported to have asked the preacher, after one of his lectures, to give her the strongest evidence against theosophy. “Madam,” he replied, “the strongest evidence against theosophy is that there is no evidence in its favor.” Similarly it may be said that the burden of proof is clearly against those who advance an interpolation hypothesis; if no clear evidence can be adduced in its favor the hypothesis must be rejected, and the narrative must be taken as it stands. Even such a consideration alone would be decisive against the interpolation theory regarding the virgin birth in the infancy narrative of the Third Gospel. The advocates of the theory have signally failed to prove their point. The virgin birth is not merely narrated with great clearness in Luke 1:34 , 35 , but is implied in several other verses; and no reason at all adequate for supposing that these portions of the narrative have been tampered with has yet been adduced. But as a matter of fact we are in the present case by no means limited to such a merely negative method of defense. The truth is that in the present case we can do far more than disprove the arguments for the interpolation hypothesis; we can also actually prove positively that that hypothesis is false. A careful examination shows clearly that the virgin birth, far from being an addition to the narrative in the first chapter of Luke, is the thing for which the whole narrative exists. There is a clear parallelism between the account of the birth of John and that of the birth of Jesus. Even the birth of John was wonderful, since his parents were old. But the birth of Jesus was more wonderful still, and clearly it is the intention of the narrator to show that it was more wonderful. Are we to suppose that while narrating the wonderful birth of John the narrator simply mentioned an ordinary, non-miraculous birth of Jesus? The supposition is quite contrary to the entire manner in which the narrative is constructed. The truth is that if the virgin birth be removed from the first chapter of Luke the whole point is removed, and the narrative becomes quite meaningless. Never was an interpolation hypothesis more clearly false. But personally I am very glad that the interpolation hypothesis has been proposed, because it indicates the desperate expedients to which those who deny the virgin birth are reduced. The great majority of those who reject the virgin birth of Christ suppose that the idea arose on pagan ground, and admit that other derivations of the idea are inadequate. But in order to hold this view they are simply forced to hold the interpolation theory regarding the first chapter of Luke; for only so can they explain how a pagan idea came to find a place in so transparently Jewish a narrative. But the interpolation theory being demonstrably false, the whole modern way of explaining the idea of the virgin birth of Christ results in signal failure. The naturalistic historians in other words are forced by their theory to hold the interpolation hypothesis; they stake their all upon that hypothesis. But that hypothesis is clearly false; hence the entire construction falls to the ground. So much then for the account of the virgin birth in Luke. Let us now turn to the Gospel according to Matthew. Here the virgin birth is narrated with a plainness which leaves nothing to be desired. Some men used to say that the first two chapters of the Gospel are a later addition, but this hypothesis has now been almost universally abandoned. The value of this testimony depends of course upon the view that is held of the Gospel as a whole. But it is generally admitted by scholars of the most diverse points of view that the Gospel was written especially for Jews, and the Jewish character of the infancy narrative in the first two chapters is particularly plain. manuscripts, the Codex Vaticanus and the Codex Sinaiticus, which also have the inestimable advantage of being manuscripts of the original Greek, not of a mere Syriac translation. But the Sinaitic Syriac is a very ancient manuscript, having been produced at about 400 A.D., and despite the fact that the extravagant claims made for it have now for the most part been abandoned, a few words about it may still be in place. The Sinaitic Syriac has a curious reading at Matthew 1:16 . But the importance of this witness must not be exaggerated. In order to accept the witness of the Sinaitic Syriac against all other documents one must suppose (1) that this manuscript has correctly reproduced at the point in question the ancient Syriac translation from which it is descended by a process of transmission, (2) that this ancient Syriac translation (which was probably produced in the latter part of the second century) correctly represented at this point the Greek manuscript from which the translation was made, and (3) that that Greek manuscript correctly represented at this point the autograph of the Gospel from which it was descended by a process of transmission. All of this is exceedingly uncertain in view of the over-whelming mass of evidence on the other side. To accept one witness against all the other witnesses is a very precarious kind of textual criticism where the evidence is so exceedingly abundant as it is in the case of the New Testament. But as a matter of fact the Sinaitic Syriac does not deny the virgin birth at all. It attests the virgin birth in Matthew 1:18-25 just as clearly as do the other manuscripts, and it implies it even in Matthew 1:16 . The reading of the Sinaitic Syriac which has given rise to the discussion is (translated into English by Burkett) as follows : “Jacob begat Joseph. Joseph, to whom was betrothed Mary the virgin, begat Jesus that is called the Messiah.” That would be self-contradictory if the word “begat” meant what it means in English. But as a matter of fact the scribe of the Sinaitic Syriac, if he thought of what he was doing and was not simply making a careless mistake, clearly used the word “begat” in the sense, “had as a legal descendant.” It is interesting to note that Professor F. C. Burkitt, the greatest British authority on the Syriac manuscripts, who certainly is far from being prejudiced in favor of the virgin birth, holds that even if the original text were simply “Joseph begat Jesus” (which as a matter of fact appears in no manuscript) it would be absolutely without significance as a testimony against the virgin birth; for it would only mean that Joseph had Jesus as his legal heir. The author of the First Gospel is interested in two things, in one of them just as much as in the other. He is interested in showing (1) that Jesus was the heir of David through Joseph and (2) that He was a gift of God to the house of David in a more wonderful way than would have been the case if He had been descended from David by ordinary generation. Thus even if the Sinaitic Syriac did represent the original text, it would not deny the virgin birth. But as a matter of fact it does not represent the original text at all. The original text of Matthew 1:16 is exactly the text that we are familiar with in our Bibles. Accordingly we have an unequivocal double witness to the virgin birth of Christ in the Gospels of Matthew and of Luke. These two witnesses are clearly independent. If one thing is clear to modern scholars—and to every common-sense reader—it is that Matthew has not used Luke and Luke has not used Matthew. The very difficulty of fitting the two infancy narratives together is, to the believer in the virgin birth, a blessing in disguise; for it demonstrates at least the complete independence of the two accounts. The unanimity of these two independent witnesses constitutes the very strongest possible testimony to the central fact about which they are perfectly and obviously agreed. But at this point an objection is often made. The rest of the New Testament, we are told, says nothing about the virgin birth; Paul says nothing about it, neither does Mark. Hence the testimony in favor of it is often said to be weak; and men are often impressed with this argument from silence. Now the argument from silence needs to be used with a great deal of caution. The silence of a writer about any detail is without significance unless it has been shown that if the writer in question had known and accepted that detail he would have been obliged to mention it. But that is just exactly what cannot be shown in the case of the silence about the virgin birth. Paul, for example, does not mention the virgin birth, and much has been made of his silence. “What is good enough for Paul,” we are told in effect, “is good enough for us; if he got along without the virgin birth we can get along without it too.” It is rather surprising, indeed, to find the Modernists of today advancing that particular argument; it is rather surprising to find them laying down the principle that what is good enough for Paul is good enough for them, and that things which are not found in Paul cannot be essential to Christianity. For the center of their religion is found in the ethical teaching of Jesus, especially in the Golden Rule. But where does Paul say anything about the Golden Rule, and where does he quote at any length the ethical teachings of Jesus? We do not mean at all that the silence about such things in the Epistles shows that Paul did not know or care about the words and example of our Lord. On the contrary there are clear intimations that the reason why the Apostle does not tell more about what Jesus did and said in Palestine is not that these things were to him unimportant but that they were so important that instruction about them had been given at the very beginning in the churches and so did not need to be repeated in the Epistles, which are addressed to special needs. And where Paul does give details about Jesus the incidental way in which he does so shows clearly that there is a great deal else which he would have told if he had found occasion. The all-important passage in I Corinthians 15:3-8 provides a striking example. In that passage Paul gives a list of appearances of the risen Christ. He would not have done so if it had not been for the chance (humanly speaking) of certain mis-understandings that had arisen in Corinth. Yet if he had not done so, it is appalling to think of the inferences which would have been drawn from his silence by modern scholars. And yet, even if the occasion for mentioning the list of appearances had not happened to arise in the Epistles it would still have remained true that that list of appearances was one of the absolutely fundamental elements of teaching which Paul gave to the churches at the very beginning. That example should make us extremely cautious about drawing inferences from the silence of Paul. In the Epistles Paul mentions very few things about the earthly life of Jesus; yet clearly he knew far more than in the Epistles he has found occasion to tell. It does not at all follow therefore that because he does not mention a thing in the Epistles he did not know about it. Hence the fact that he does not mention the virgin birth does not prove that the virgin birth was to him unknown. Moreover, although Paul does not mention the virgin birth the entire account which he gives of Jesus as an entirely new beginning in humanity, as the second Adam, is profoundly incongruous with the view that makes Jesus the son, by ordinary generation, of Joseph and Mary. The entire Christology of Paul is a powerful witness to the same event that is narrated in Matthew and Luke; the religion of Paul presupposes a Jesus who was conceived by the Holy Ghost and born of the Virgin Mary. The silence of Mark is of just as little importance as the silence of Paul. The Gospel according to Mark seems to have been pre-eminently the missionary gospel; it was not intended to give all the facts about Jesus, but simply those which needed to be given first to those who had not already been won to Christ. Reading the Second Gospel, you stand in astonishment like those who were in the synagogue at Capernaum in the scene described in the first chapter. You see the wonderful works of Jesus; you stand afar off looking at Him; you are not introduced to Him with the intimacy of detail which one finds in Matthew and Luke. The fact that Mark does not narrate the virgin birth does not prove that he does not believe in the virgin birth or that it is to him less important than other facts; but shows merely that the narration of the birth of Jesus in any form is quite contrary to the plan of his Gospel, which begins with the public ministry. The most important things that need to be said are not always the first things; and Mark is concerned with the first things that would make an impression even upon those who had not already been won to Christ. The New Testament does indeed imply that the contemporaries of Jesus in Palestine were unaware of the story of the virgin birth, and perhaps it also “makes probable that the virgin birth formed no part of the earliest missionary preaching of the apostles in Jerusalem. But all that is just what would be expected even if the virgin birth was a fact. The virgin birth was a holy mystery which was capable of the grossest misunderstanding; certainly it would not be spoken of by a person like Mary whose meditative character is so delicately and so vividly depicted in the first two chapters of Luke. It would not be spoken of to the hostile multitude, and least of all would it be spoken of to the brothers of Jesus. Also it would certainly not be mentioned in the earliest public missionary preaching before the crowds in Jerusalem. Only at some time after the resurrection, when the miracle of the virgin birth had at last been vindicated by the resurrection and exaltation of Jesus would Mary breathe the mystery of Jesus’ birth to sympathetic ears. Hence it found its way into the wonderful narrative preserved by Luke and from there into the hearts of Christians of all the ages. Such is the course of events which would be expected if the virgin birth was a fact. And the attestation of the event in the New Testament is just exactly what is suited to these antecedent probabilities. The attestation in the very nature of the case could not be equal to that of an event like the resurrection, of which there were many eye-witnesses; but it is just what it would naturally be if the event really occurred in the manner in which it is said to have occurred in Matthew and Luke. But the full force of the New Testament evidence can be appreciated only if the accounts are allowed to speak for themselves. These narratives are wonderfully self-evidencing; they certainly do not read as though they are based on fiction; and they are profoundly congruous with that entire account of Jesus without” which the origin of the Christian religion is an insoluble puzzle.